Abstract: Hemangioblastomas are benign tumors of the central nervous system (CNS) that may occur either sporadically or as part of von Hippel–Lindau (VHL) disease, in which they coexist with a series of other tumors outside the CNS. Because of their low mitosis rate, hemangioblastomas usually have slow-growing and late manifestations, but may cause sudden neurological symptoms if tumor hemorrhage occurs. Few studies have evaluated the impact of pregnancy on the evolution of hemangioblastomas. Some authors have reported tumor growth in women with VHL disease, but no such association was observed by others. The influence of pregnancy on sporadic hemangioblastomas remains largely unexplored. 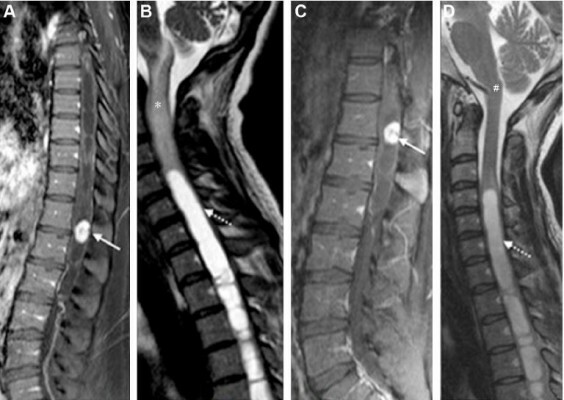 We report here the case of a pregnant woman whose first manifestation of sporadic spinal hemangioblastoma was life-threatening, rapidly progressive dysautonomia. In addition, we discuss the role of pregnancy in the triggering of symptoms, as well as the possibility of medically indicated delivery for the management of these tumors.